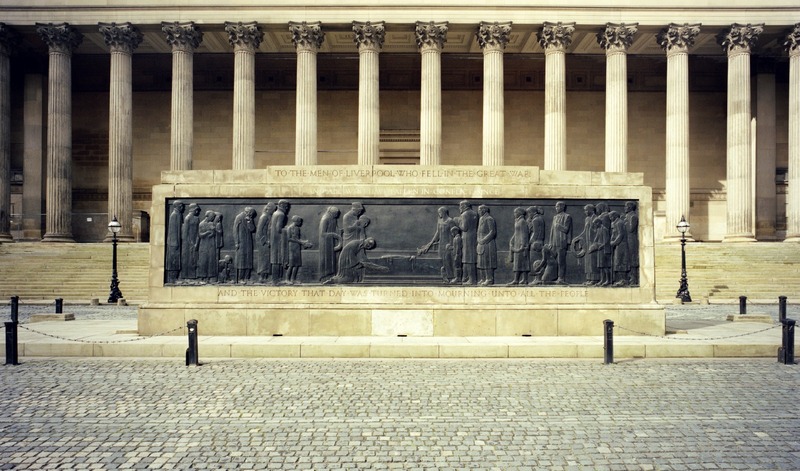 Designed by local architect Lionel Budden, the altar-like Liverpool Cenotaph is adorned with some of local sculptor Herbert Tyson-Smith’s most powerful work. The craftsmanship of these bronze reliefs is outstanding, with powerful and modern designs forming a poignant reminder of the effects of the war on Liverpool. 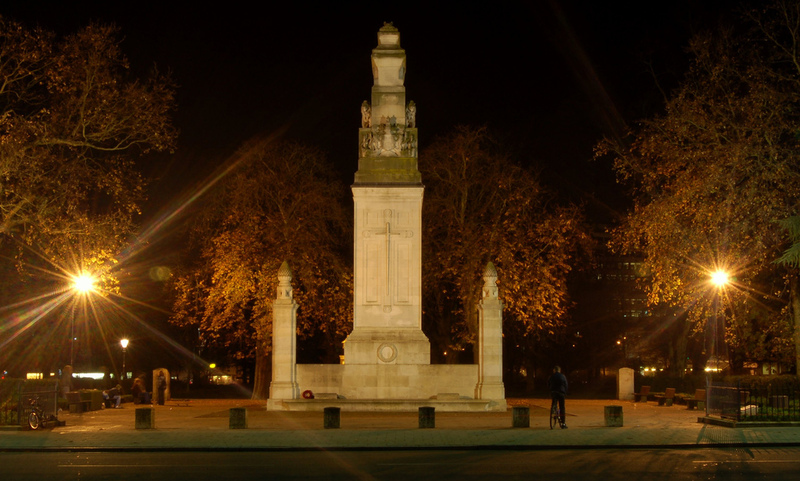 The memorial commemorates 25,000 British and Commonwealth sailors, around 10,000 in the First World War and 15,000 in the Second World War, who died at sea and had no known grave. 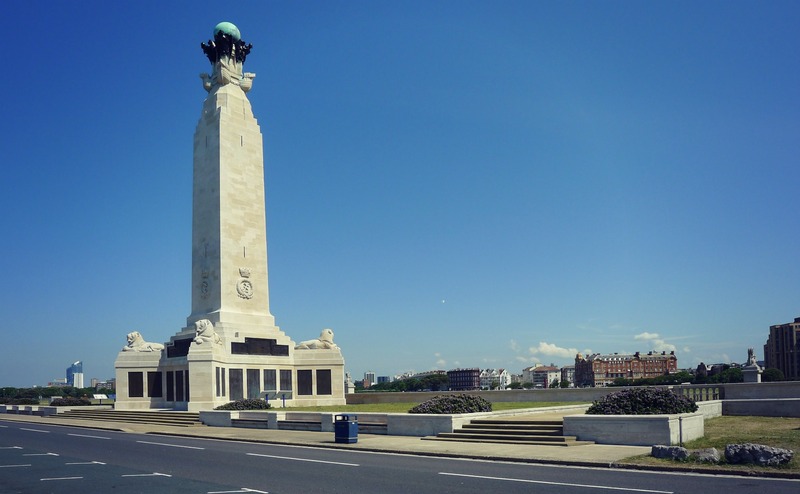 On an Admiralty recommendation, three identical memorials were erected after the Second World War at the main naval ports in Great Britain: Chatham, Plymouth and Portsmouth. After the Second World War architect Sir Edward Maufe, with sculpture by Charles Wheeler, William McMillan and Esmond Burton. Nurse Edith Cavell was executed in 1915 in Brussels by the Germans for harbouring and assisting allied soldiers. Inscribed on the sides of the monument are the words, HUMANITY, SACRIFICE, FORTITUDE and DEVOTION. Edith Cavell’s own words, PATRIOTISM IS NOT ENOUGH. I MUST HAVE NO HATRED OR BITTERNESS FOR ANYONE were added several years after the unveiling. Unveiled in 1923, this exceptional sculpture of a group of soldiers was one of the largest bronze works made at the time. Unusually, the names of the fallen are recorded in a book, whose pages are turned mechanically, and displayed behind glass within the memorial. 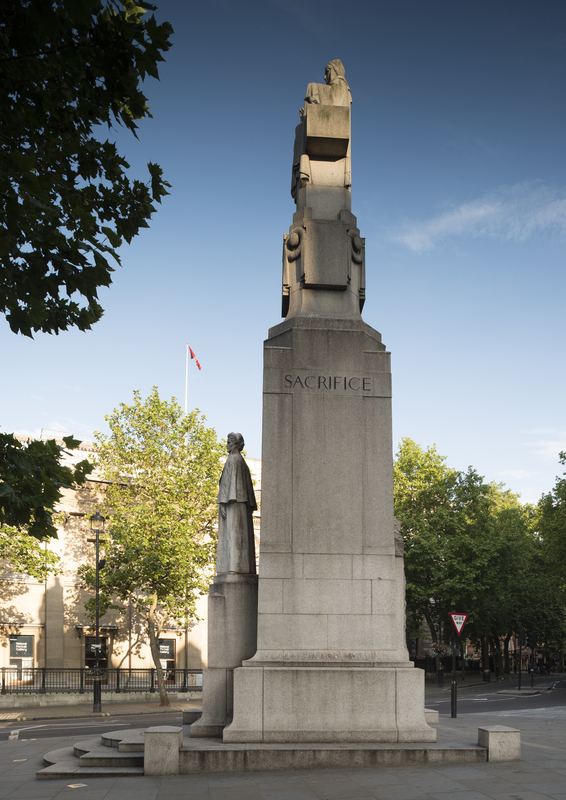 Widely regarded as one of the truly outstanding memorials of the First World War anywhere, the Royal Artillery Memorial commemorates the 49,076 members of the Royal Artillery who lost their lives in the conflict. The reliefs around the base depict different forms of artillery warfare, from trench mortars and anti-aircraft guns to heavy batteries. Around it stand heroic bronze figures of different ranks of gunners: a lieutenant, a shell-carrier and a driver. A great coat-draped corpse lies at the north end. 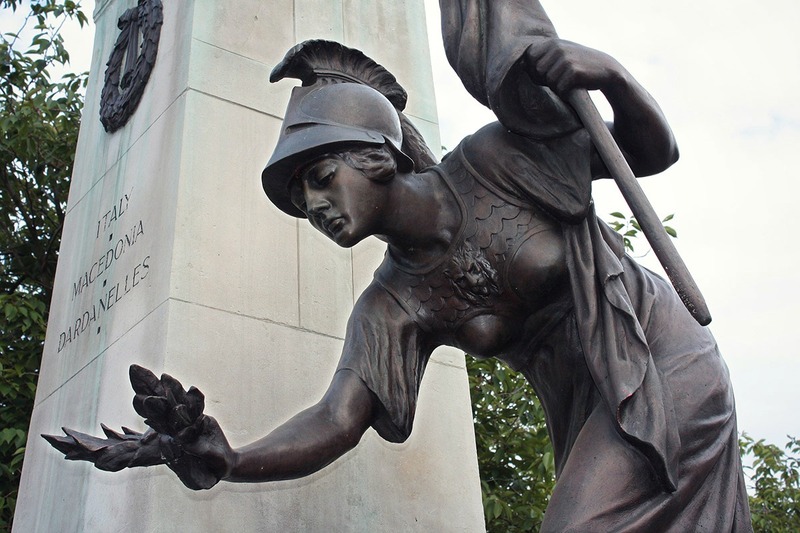 The newly cleaned Royal Artillery Memorial, Liverpool Cenotaph, and the Edith Cavell Memorial were recently upgraded to Grade I, among just 2.5% of listed buildings. This unique memorial was designed by local landowner and MP for Hull, Mark Sykes, who served in the First World War. 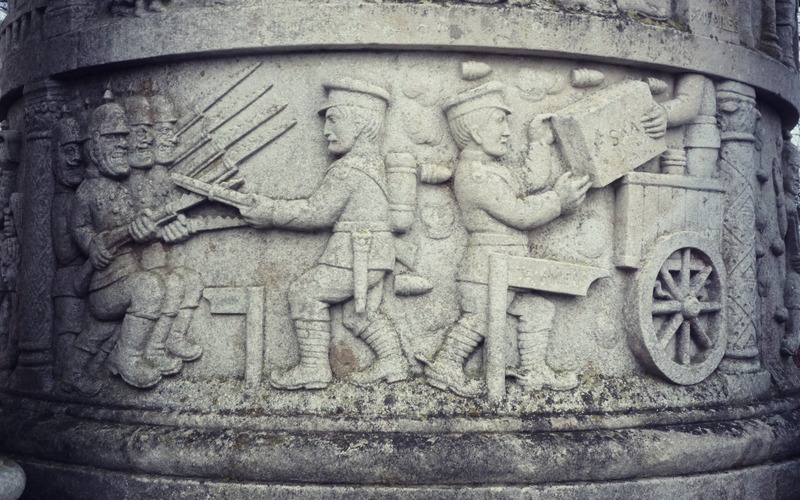 Its story-like carvings commemorate the lives of 1000 wagon drivers (Waggoners), recruited and trained by Sykes in the nearby fields, to supply the trenches on the Western Front. 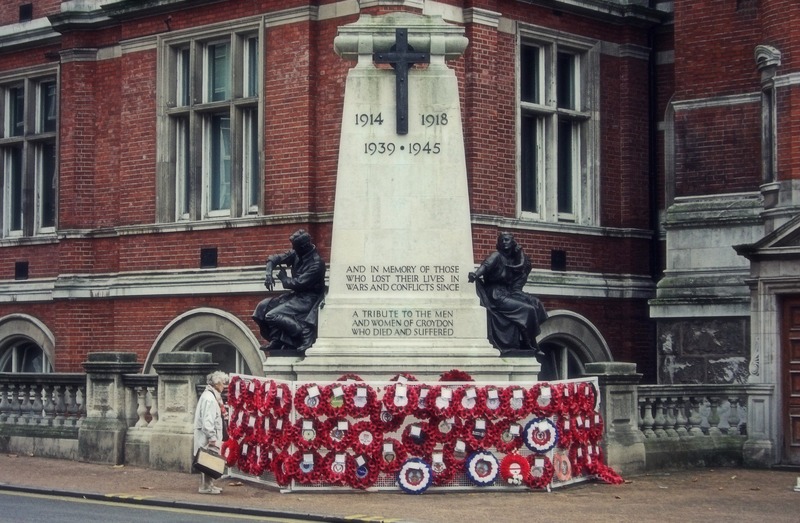 A tribute to the men and women of Croydon who died in the war, there is a sculpture of a woman cradling a young child and reaching out longingly to a sculpture of a man tending to his own wounds. 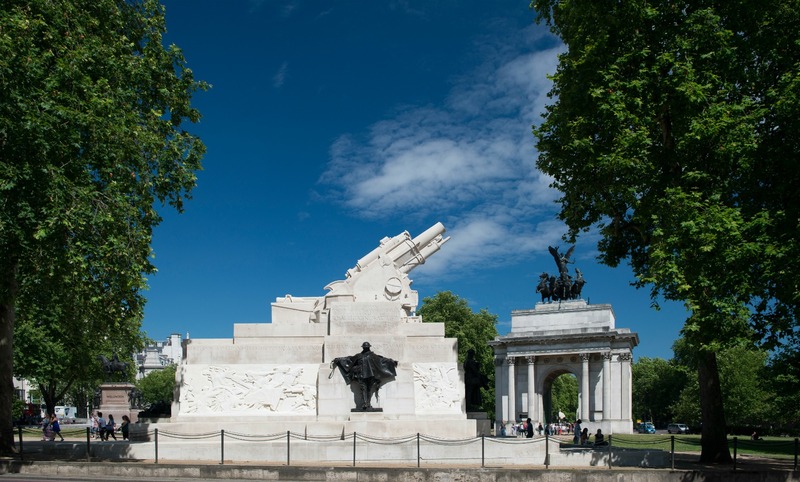 Following the First World War, memorials were normally designed to depict either heroic triumphalism or detached contemplation, and avoided evoking the horrors of war. The Macclesfield memorial is an exception to the general rule as it depicts the gruesome death of a soldier who has died from gassing, his hand clutching a gas mask which he has not had time to place over his face. Britannia is leaning over the soldier, about to place a laurel wreath on his head. For the first time in history, millions of combatants disappeared in the explosive reality of modern static warfare. Those dead who could be found were laid to rest in ‘some corner of a foreign field’. The grief over the absent dead was profound. In July 1919, a temporary structure was designed by Edwin Lutyens as a fictive national tomb, where parading soldiers could pay their last respects to the dead. 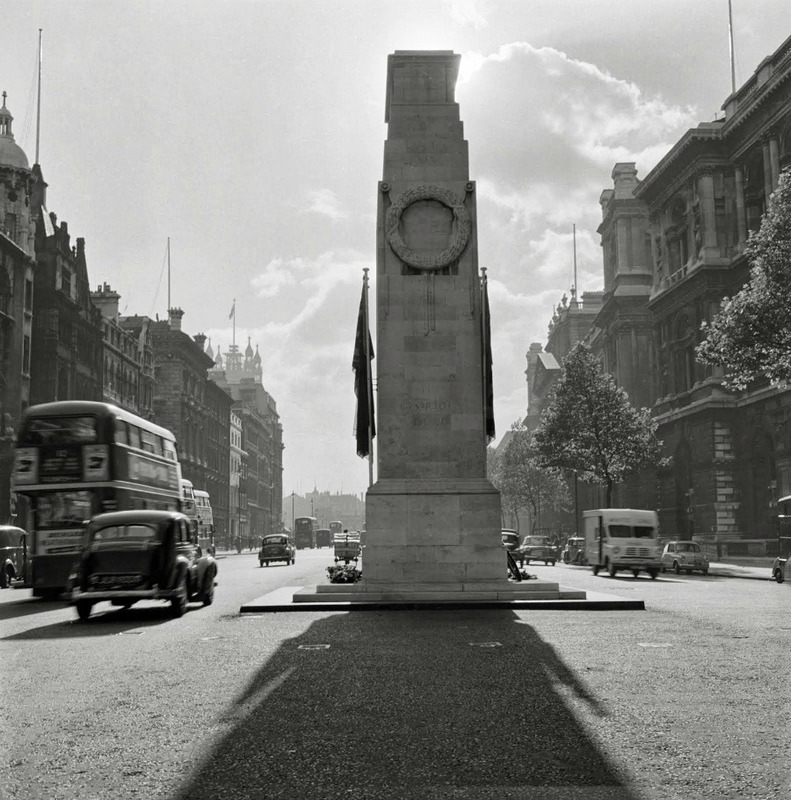 The Cenotaph so caught the public and political imagination that it was rebuilt in stone in 1920, and was described by The Times as ‘simple, massive, unadorned’. 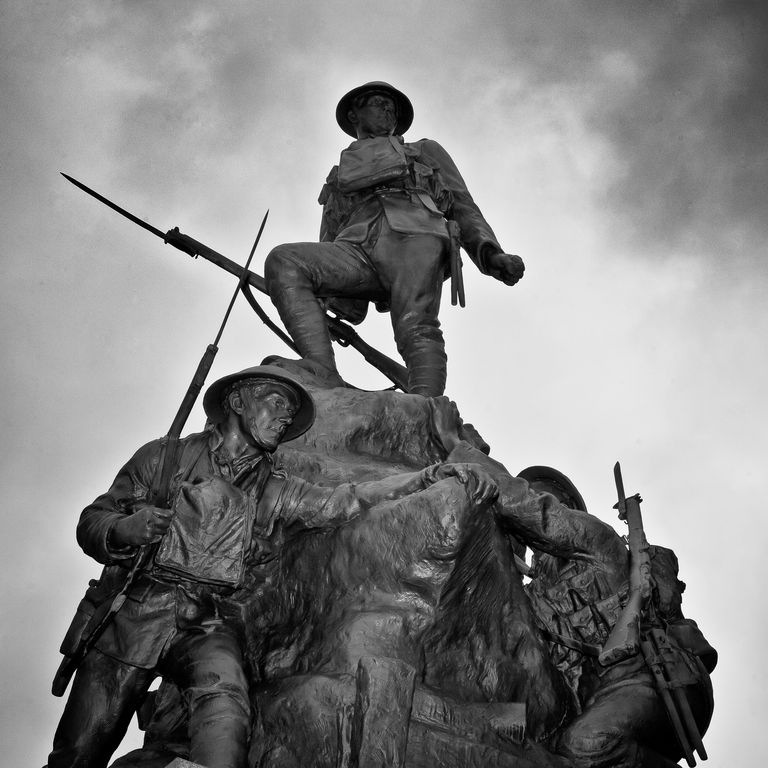 Check out the memorial at Port Sunlight on the Wirral Peninsula and also Clitheroe’s memorial in Lancashire – they are also amazing. Please have a look at my blog http://www.stephenliddell.co.uk to see our new WW1 memorial. see ‘Dover Marine War Memorial’ on Wikipedia: this too is magnificent. The Portsmouth one has two twins at Plymouth and Chatham, all with similar but non-identical surrounds added after WWII. I consider Chatham the best situated as it is atop a hill with more space around than the others, although all three impress. Next post What do Buddhist Buildings Tell Us About Buddhist Communities in England?